At United Products, we take pride in providing our valued customers with a variety of products. We realize that stock items will not fit everyone’s needs, so let us customize to your specific needs. Logo imprinting is a great way to get name recognition. From logo imprinting on stock items such as acrylic brochure holders and sign holders to custom designed displays totally unique to accommodate your requirements, our skilled team is ready for your request. Call for a quote today! To compete in today’s market, consistent branding is critical for success. Your product will stand out from the rest and look professional. 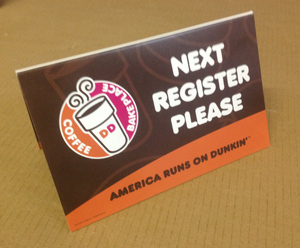 Personalizing literature holders, acrylic displays, banking signs, to name just a few of the applications. Customized silk-screening brings valuable brand impressions at an inexpensive price.